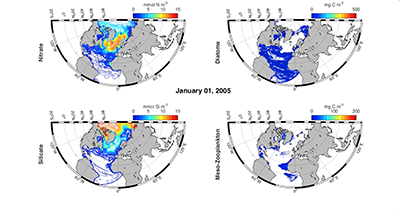 The Ocean Modeling Group at NERSC performs research in modeling of physical ocean processes, marine ecosystem and data assimilation with applications towards operational oceanography, marine research, and climate research. Our research centers around the ocean model HYCOM with ecosystem applications (HYCOM-NORWECOM and HYCOM-ECOSMO). In collaboration with the Data Assimialtion Group (https://www.nersc.no/group/data-assimilation-and-forecasting-group) the EnKF is applied both for parameter and state estimation in these models.